The theme of this book cuts across disciplines. Contributors to this volume are specialized in education and especially classroom research as well as in linguistics, most being transdisciplinary themselves. 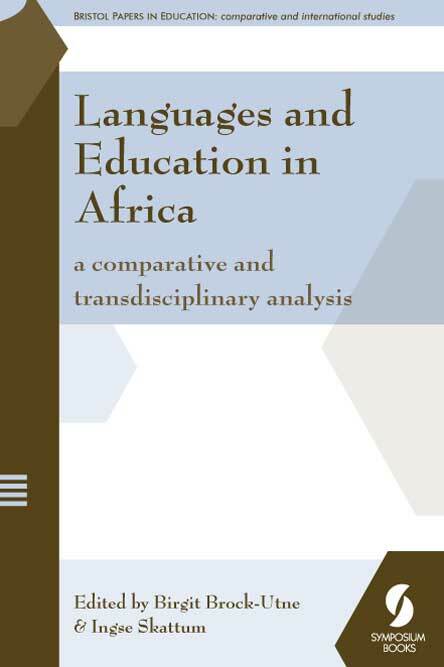 Around 65 sub-Saharan languages figure in this volume as research objects: as means of instruction, in connection with teacher training, language policy, lexical development, harmonization efforts, information technology, oral literature and deaf communities. The co-existence of these African languages with English, French and Arabic is examined as well. This wide range of languages and subjects builds on recent field work, giving new empirical evidence from 17 countries: Botswana, Ethiopia, Ghana, Kenya, Madagascar, Malawi, Mali, Mozambique, Niger, Nigeria, Senegal, South Africa, Swaziland, Tanzania, Uganda, Zambia and Zimbabwe, as well as to transnational matters like the harmonization of African transborder languages. As the Editors – a Norwegian social scientist and a Norwegian linguist, both working in Africa – have wanted to give room for African voices, the majority of contributions to this volume come from Africa. Parents’ and Policy Makers’ Insistence on Foreign Languages as Media of Education in Africa: restricting access to quality education – for whose benefit? While research findings show that the use of foreign languages as medium of instruction in Africa restricts access to quality education, policy makers have been insisting on employing foreign languages as the medium of school instruction. Although the examples to illustrate how the use of foreign languages as medium of instruction restricts access to quality education are here drawn from Tanzania, studies in other countries like Kenya, Malawi, Ghana, Nigeria and South Africa demonstrate similar findings. This chapter addresses why this is so, and further asks who benefits, if anyone at all, from restricted access to quality education. The effects and implications of employing foreign languages as media of education are also discussed and the chapter proposes the way forward. This chapter locates continued difficulties faced by mother-tongue education in Africa in the context of the nature of the state in Africa, the position of the elites vis-à-vis the issue, and the challenges of emancipation and development. It claims that, in order to make headway a counter-elite needs to emerge from within the existing elites, and to seek alternatives and revisions to current language of instruction policies in Africa. The chapter argues that, in as far as neo-colonial language of instruction policies constrain the emancipation process and the cultural freedom of the masses, they are historically ultimately doomed because they stand in the way of freedom. Whether the process proceeds in an evolutionary fashion or assumes a revolutionary character will depend on the extent to which the ruling elites, in this respect, are susceptible to policy revisions. In this chapter, a critical overview is provided of the main issues related to the promotion of African languages as means of instruction in education in Africa. The first part of the paper suggests that in order to understand and effectively address the issue of language in education policy in African countries such as Niger, one has to understand the operations of power, hegemony, and cultural reproduction within the educational sector. Subsequently, the second part of the paper examines the role of international development agencies, African elites and researchers as well as western researchers in defining language in education policies during the postcolonial period. Finally, the third part extensively discusses the importance of defining the cultural foundations of African education and argues for the promotion of quality multilingual and multicultural education in African countries. Along with this call for action, the author identifies factors that are conducive for the promotion of African languages for education and development in Africa. This chapter examines one particular issue against the background of changes in South Africa’s higher education system consequent upon the advent of a non-racial democracy – the possibility of implementing multilingual policies in its universities. Beginning with some of the reasons for this new imperative, the chapter considers some changes of a relatively practical nature pertaining to changing the linguistic landscapes of some universities. It then focuses on the kinds of activities needed before indigenous languages can be considered as possible media of instruction. Much of this discussion centres on the nature of semantics in translation. As a case study in semiotic inculcation the efforts of missionaries in certain locations in west and southern Africa are evaluated. This forms a prelude to characterising the nature of scientific language and possibilities of translation and terminological development. The chapter argues that whilst inculcating a language like Xhosa as a fully functional medium of instruction amongst many of its monolingual mother-tongue speakers in primary schools is a practical and achievable necessity, there are good reasons to be more cautious within higher education. The Use of National Languages in Mali’s Educational System: history, challenges and perspectives National languages (NL) are used as the medium of instruction alongside French in the first cycle of primary school in Mali. There have been three phases: 1. 1979-87: a restricted use: 108 schools in 1987, in four NL, 1st-4th year; 2. 1987-2002: introduction of Convergent Pedagogy: 2050 schools in 2002, in 11 of the 13 NL, 1st-6th year; 3. 2002-present day: bilingual curriculum structured by competencies: 2550 schools in 2005-06 (31.62% of the schools). The challenges concern attitudes towards NL, choice of language in multilingual areas, adaptation of teaching materials to the NL, and teachers’ initial training in NL, which has not yet been introduced. Perspectives are: linguistic and educational legislation that will ensure the survival of the reform, funding that will enable the production and spread of teaching materials in NL, and finally, regional cooperation in order to harmonise the curricula, the teaching materials, and teacher training in NL and in ‘second’ languages (L2), i.e. the official languages. Les langues nationales (LN) sont utilisées comme médium d’instruction à côté du français au premier cycle de l’école fondamentale au Mali. Il y a eu trois étapes: 1. 1979-87: Un enseignement limité: 108 écoles en 1987, en 4 LN, 1e-4e année; 2. 1987-2002: Introduction de la Pédagogie Convergente (PC): 2050 écoles en 2002, en 11 des 13 LN, 1e-6e année; 3. 2002-: Le curriculum bilingue par compétences: 2550 écoles en 2005-06 (31.62% des écoles). Les défis concernent les attitudes envers les LN, le choix de langue dans les communautés multilingues, l’adaptation du matériel didactique aux LN et la formation initiale des enseignants, ce qui n’est pas encore le cas. Les perspectives demandent une législation linguistique et éducative qui permette de pérenniser la réforme, le financement des curricula en LN, et enfin une coopération sous-régionale pour harmoniser les curricula, le matériel didactique et la formation en LN et en langues ‘secondes’ (officielles). This article analyses the respective roles of Arabic and national languages (Bambara, Songhay, and/or Tamachek) in 14 modernising Islamic schools, located in Bamako, Touba (Cercle de Banamba), Segu, and Timbuktu. Unlike Mali’s secular schools, which until recently taught mainly or exclusively in French, the madrasa do not have a policy of total immersion in the foreign language. In line with traditional Islamic education (the Koranic schools and majlis), the madrasa stress, at the primary level, the oral translation of Arabic written texts into a national language, this translation being carried out at the level of syntactical units. Unlike the case with traditional education, however, Arabic composition and oral expression are taught by means of specific exercises. In some schools, the national language retains an important role, in oral discussion and explanation, at the secondary level. Le rôle des langues nationales dans les écoles musulmanes modernistes (madrasa) au Mali Ce chapitre analyse les rôles respectifs des langues nationales (bambara, songhay et/ou tamachek, selon les cas) et de l’arabe dans 14 écoles musulmanes qui se disent « modernes », situées à Bamako, Touba (Cercle de Banamba), Ségou et Tombouctou. A la différence des écoles laïques, qui jusqu’à récemment enseignaient principalement ou exclusivement en français, les madrasa ne préconisent pas l’immersion totale dans la langue étrangère. Manifestant sur ce point des continuités importantes avec l’enseignement islamique traditionnel (écoles coraniques et majlis), les madrasa privilégient, au niveau primaire, la traduction orale dans la langue nationale des textes écrits en arabe, cette traduction s’effectuant unité syntaxique par unité syntaxique. A la différence de cet enseignement traditionnel toutefois, l’expression orale et la rédaction en arabe font l’objet d’exercices spécifiques. Dans certains établissements, la langue nationale conserve un rôle important, à l’oral, aussi au niveau secondaire. The island of Madagascar has only one national language – Malagasy. Its sociolinguistic situation is triglossic: the official variety of Malagasy dominates the other varieties, while Standard French, inherited from colonisation, dominates Malagasy, viewed as the set of its varieties. French, which remains the main tool for social promotion, is also the major medium of instruction and the working language of the modern sector. Malagasy people come to know certain objects and notions (e.g. initiative, ambition) that are useful for the country’s development through learning such international languages as French and English. Malagasy language teaching that is based on a comparative approach would enable the learners to be aware of the differences between their home language, the official variety of Malagasy and French. They would thus be better equipped to face globalisation as it would be easier for them to grasp the cultural specificities related to these languages and beyond, to determine the values that are beneficial to their country. L’enseignement de la langue nationale comme outil d’intégration de Madagascar dans la mondialisation L’île de Madagascar possède une langue nationale unique – le malgache. Sa situation sociolinguistique est cependant triglossique : la variété officielle du malgache domine les autres variétés tandis que le français standard, hérité de la colonisation, domine le malgache, entendu comme étant l’ensemble de ses variétés. Le français, qui demeure le principal outil de promotion sociale, est aussi le principal médium d’instruction et la langue de travail du secteur moderne. C’est par le biais de l’apprentissage de langues internationales telles que le français et l’anglais que les Malgaches en viennent à connaître des objets et des notions (par exemple, initiative, ambition) utiles au développement de leur pays. Ce chapitre préconise un enseignement du malgache fondé sur une approche comparative, de sorte que les apprenants sont pleinement conscients des différences entre leur langue au foyer, la variété officielle du malgache et le français. Ils seraient ainsi mieux armés pour faire face à la mondialisation dans la mesure où il leur serait plus facile d’appréhender les spécificités culturelles qui sous-tendent ces différentes langues et, au-delà, de déterminer les valeurs qui sont bénéfiques à leur pays. The 1994 Education and Training Policy of Ethiopia recommends a shift from English into mother tongues as languages of instruction (LOI) in upper primary education (UPE, grades 7 and 8). Four of the eleven regional states have followed this recommendation while seven have opted to use English as an LOI rather than the mother tongues. This study addresses the question: How does the use of mother tongues instead of the use of English in the UPE, grades 7-8, affect students’ achievement in English, sciences and math? Data were procured from the 2000 and 2004 Grade 8 National Assessment examinations. Findings reveal that the use of mother tongues in education has resulted in better achievements in sciences and math and not significant differences in English achievements when compared to the use of English as LOI. L’utilisation des langues maternelles plutôt que l’anglais comme moyen d’instruction: implications pour la réussite scolaire en Ethiopie En 1994, dans sa Politique d’enseignement et de formation, l’Ethiopie a recommandé qu’on passe de l’anglais aux langues maternelles comme moyen d’instruction au second cycle de l’enseignement primaire (7e et 8e années). Quatre des onze Etats régionaux ont suivi cette recommandation, tandis que sept ont préféré garder l’anglais comme langue d’instruction. La présente étude a voulu savoir comment le passage de l’anglais aux langes maternelles comme moyen d’instruction en 7e et 8e années a pu influencer les résultats des élèves en anglais, en sciences et en mathématiques. Les données proviennent des Résultats d’examens au niveau national pour la 8e année en 2000 et 2004. Il s’est avéré que les écoles enseignant en langues maternelles avaient de meilleurs résultats en sciences et en mathématiques que celles enseignant en anglais, et qu’en anglais, il n’y avait pas de différence significative entre les deux types d’écoles. African countries continue to rely on ex-colonial languages for education, commerce and governance despite the lack of tangible evidence to suggest that the choice of an external (and by extension less familiar) language is beneficial to the majority of the indigenous populations. Nearly half a century after the demise of colonial rule, the majority of African states have yet to find a formula for weaning their societies from the use of ex-colonial languages as main vehicles for acquiring new knowledge and skills. This chapter explores the strategies that can be adopted by Southern African states to implement language practices that favour indigenous languages over ex-colonial languages in the field of education. It is argued that: (1) extending the use of indigenous languages as media of instruction beyond the traditional formative years of formal education can be done seamlessly in phases; and (2) there is now sufficient home-grown expertise for the region to produce the necessary learning materials in local languages. Sevrer l’Afrique de l’Europe : vers une politique d’enseignement en langue maternelle en Afrique australe Les pays africains dépendent encore aujourd’hui des langues ex-coloniales pour leur éducation, leur commerce et le gouvernement de leurs Etats et ce, malgré le manque de preuves concrètes que le choix d’une langue exogène (venue de l’extérieur et donc moins connue) soit bénéfique pour la majorité des populations endogènes (autochtones). Près d’un demi-siècle après la fin de l’époque coloniale, la majorité des Etats n’a pas encore trouvé le moyen de sevrer leurs sociétés de l’usage des langues ex-coloniales comme principal médium pour l’acquisition des nouveaux savoirs et savoir-faire. Ce chapitre examine les stratégies susceptibles d’être adoptées par les Etats de l’Afrique australe pour mettre en oeuvre des pratiques langagières qui favoriseraient les langues du terroir plutôt que les langues ex-coloniales dans le domaine de l’éducation. Il argumente que (1) l’extension des langues endogènes comme médium d’instruction au-delà des années formatives de l’enseignement formel, traditionnellement réservées à cet enseignement, peut se faire sans rupture, par phases; et (2) la sous-région possède maintenant l’expertise nécessaire pour produire elle-même le matériel didactique en langues nationales. This chapter discusses results from an ongoing research project supported by the Open Society Initiative for Southern Africa (OSISA) on the state, nature and challenges of the training of teachers of indigenous African languages in Southern Africa. The chapter examines the training of teachers of African languages in Botswana and Zambia. It is structured in the following sections: a description of the linguistic landscape of Botswana and Zambia; analysis of the syllabi used in the training of teachers of African languages; a brief description of the materials used and the medium in which they are written; and challenges of teaching African languages in primary school teachers’ colleges. A summary and recommendations for possible intervention are provided in the concluding section. La formation des enseignants de langues africaines en Afrique australe avec référence particulière au Botswana et à la Zambie Ce chapitre discute des résultats provenant d’une recherche en cours, soutenue par l’Initiative pour une société ouverte en Afrique australe (‘Open Society Initiative for Southern Africa’, OSISA), concernant le statut, la nature et les défis de la formation des enseignants de langues endogènes en Afrique australe. Le chapitre examine la formation des enseignants de langues africaines au Botswana et en Zambie. Il est constitué des sections suivantes : une description de la situation linguistique de ces deux pays ; une analyse des programmes en vigueur pour la formation des enseignants de langues africaines ; une brève description du matériel didactique utilisé, y compris la langue choisie pour leur rédaction ; et les défis de l’enseignement des langues africaines dans les écoles normales des maîtres du premier cycle. Hormis le résumé de ces points, la conclusion comporte des recommandations pour d’éventuelles interventions. This study investigates the English proficiency of students and teachers in Tanzanian secondary schools and the way they cope with the English/Kiswahili dilemma during science lessons. Data were collected through participant observation, interviews and a quasi-experiment. Findings show that English was a problem for the majority of teachers and students, who were unable express themselves clearly. A number of coping strategies were used: teaching in Kiswahili, code-switching, safe talk and negative reinforcement (punishment). Test results suggest that the use of Kiswahili as medium of instruction (MOI) tends to promote performance and minimise the differences among students, while for English it is the opposite and for code-switching midway. It can be concluded that English as MOI is a barrier to effective teaching/learning in Tanzanian secondary schools and that this barrier can be surmounted by using Kiswahili as MOI. Tous les moyens sont bons: pour une solution au dilemme anglais/kiswahili dans les classes du secondaire en Tanzanie Cette étude examine les compétences en anglais parmi les étudiants et les professeurs à l’école secondaire en Tanzanie, et leur manière de résoudre le dilemme anglais/kiswahili en classe de science. Les données ont été collectées à l’aide de l’observation participante, l’interview et un test. Les résultats montrent que l’anglais constituait un problème pour la majorité, qui avait du mal à s’exprimer clairement. Les enseignants avaient recours à plusieurs stratégies: l’utilisation kiswahili, l’alternance des codes, safe talk (questions sans valeur pédagogique du type: ‘Avez-vous compris?’) et des sanctions. L’analyse des tests suggère que le kiswahili comme langue d’instruction améliore les résultats et réduit les différences entre étudiants, alors que l’anglais a l’effet contraire, et que l’alternance des codes produit des résultats intermédiaires. On peut conclure que l’anglais comme moyen d’instruction est un obstacle à un enseignement/apprentissage efficace à l’école secondaire en Tanzanie et qu’on surmonterait cet obstacle en utilisant le kiswahili. This chapter discusses the handling of synonyms and variants in the more recent monolingual Shona dictionaries (1996-2006) when compared with the preceding bilingual Shona–English dictionaries (1959-84). The discussion critically reviews the policy decision of the ALLEX project team to abandon dialect labelling in light of: inadequate knowledge and documentation of language variation in Zimbabwe; ethnic and political sensibilities associated with the use and misuse of language varieties as ‘tribal’ labels; reactions of critics and feedback from users of the ALLEX dictionaries; inputs of working reference groups for terminological dictionaries; and the different requirements of general and specialised dictionaries. The article concludes with a general discussion of the impact of monolingual lexicography on language standardisation and trends towards the harmonisation of the Bantu languages in post-colonial Africa. Langue, dialecte et région : la variation linguistique dans les dictionnaires shona Ce chapitre discute les solutions choisies pour traiter les synonymes et les variantes dans les dictionnaires monolingues shona (1996-2006), plus récents que les dictionnaires bilingues shona–anglais précédemment parus (1959-84). La décision prise par l’équipe du projet ALLEX de ne pas inclure la détermination dialectale des entrées, est revue à la lumière de: l’insuffisance des connaissances et des données concernant la variation linguistique au Zimbabwe; la susceptibilité ethnique et politique résultant de l’utilisation – et de l’abus – des étiquettes ‘tribales’ appliquées aux variétés linguistiques; les réactions critiques et celles des utilisateurs des dictionnaires ALLEX; l’apport des groupes de référence pour les dictionnaires de terminologie spécialisée; et les exigences spécifiques des dictionnaires généraux et des dictionnaires specializes. La fin du chapitre consiste en une discussion générale sur l’impact de la lexicographie monolingue sur la standardisation et les tendances dans l’harmonisation des langues bantoues dans l’Afrique post-coloniale. The case of Shona in Zimbabwe has often been cited as an example of a successful language planning process that harmonised and standardised five Shona dialects into one language. Doke’s 1931 unification involved only five of the Shona dialects within Zimbabwe. This chapter argues that Doke’s (1931) work now needs revision especially in view of recent developments in Africa where there is a movement towards the harmonisation and standardisation of related dialects, so that they have a single spelling system. It argues that, in addition to the five Shona dialects that were harmonised by Doke, there is need to include more dialects that are linguistically related to Shona within Zimbabwe and across the borders, since Shona is a cross-border language that extends into neighbouring countries. L’harmonisation des variétés shona : un réexamen de Doke Le cas du shona au Zimbabwe a souvent été cité comme un processus de planification linguistique réussi, ayant eu pour résultat l’harmonisation et la standardisation de cinq dialectes shona en une seule langue. Or, l’unification de Doke en 1931 n’a concerné que cinq des dialectes shona du Zimbabwe. Ce chapitre argumente que le moment est venu de revoir le travail de Doke (1931), en particulier à la lumière du mouvement actuel en Afrique vers la l’harmonisation et la standardisation de dialectes apparantés en vue de leur donner une orthographe unique. Le chapitre argumente qu’en plus des dialectes harmonisés par Doke, il faudrait inclure d’autres dialectes apparentés, à l’intérieur du Zimbabwe comme au-delà de ses frontières, puisque le shona est une langue transfrontalière qui s’étend aux pays voisins. This chapter discusses the adjective in Shona. Based on Fortune (1955, 1980), various studies on Shona have always identified a core class that is referred to as the adjective class. This core class was defined on a morphological and semantic basis, with emphasis on morphology. The only adjectives that were identified for Shona were thus those with a prefix and a stem form. This chapter will highlight the shortcomings of purely morphological criteria in defining the Shona adjective class. It will instead propose morphosyntactic criteria, because categories should be defined from the constructions in which they appear. The chapter will show that there are some adjectives in Shona that do not have the morphological form that has hitherto been considered the main criterial feature for the adjectives. Semantic criteria will be considered as well, and the adjective class in Shona will be analysed against the background of Dixon’s (1982) seven universal semantic classes. L’adjectif en shona Ce chapitre discutera de l’adjectif en shona. Prenant comme point de départ les travaux de Fortune (1955, 1980), les différentes études sur le shona ont toujours considéré la classe des adjectifs comme une classe fermée. Cette classe était définie en fonction de critères sémantiques et surtout morphologiques. Les seuls mots reconnus comme adjectifs étaient ainsi ceux formés d’un préfixe et d’une racine. Ce chapitre montrera l’insuffisance des seuls critères morphologiques pour définir la classe des adjectifs. Il proposera de les remplacer par des critères morphosyntaxiques, car les catégories doivent être constituées en fonction des constructions dans lesquelles apparaissent les mots. Ce chapitre montrera qu’il existe en shona des adjectifs qui n’ont pas la forme morphologique considérée jusqu’ici comme la seule permettant l’admission dans la classe des adjectifs. Les critères sémantiques seront également pris en compte et les adjectifs catégorisés en les comparant avec la grille des sept catégories sémantiques universelles proposées par Dixon (1982). The idea of the harmonisation of Nguni languages of Southern Africa was first proposed by Nhlapo in 1944 and today it has not only resurfaced, but is actually being implemented. This chapter traces the harmonisation debate with a view to establishing both the political and sociolinguistic factors that favour or hinder the harmonisation of the various Nguni languages spoken in three different countries, Swaziland, South Africa and Zimbabwe. Some of the issues addressed include the motivation behind harmonisation and its intended goals, as well as the question of authority to implement it. Special focus is given to Zimbabwean Ndebele as it does not share the same geographical, legal and political environment as the rest of the languages. The implications of harmonisation on general literacy, speakers’ attitudes, literature and education are also discussed. De la standardisation à l’harmonisation : aperçu des conditions sociolinguistiques et politiques pour la création du ngouni en Afrique du Sud L’idée d’harmoniser les langues ngouni de l’Afrique du Sud, lancée d’abord par Nhlapo en 1944, a non seulement refait surface mais est actuellement en train d’être mise en oeuvre. Ce chapitre passe en revue le débat sur l’harmonisation en vue d’établir les facteurs politiques et sociolinguistiques qui favorisent ou au contraire entravent l’harmonisation des diverses langues ngouni parlées dans trois pays différents: le Swaziland, l’Afrique du Sud et le Zimbabwe. Parmi les sujets traités sont la motivation qui sous-tend l’harmonisation, ses objectifs, et la question concernant l’autorité requise pour sa mise en application. Une attention particulière est accordée au ndebele parlé au Zimbabwe, car son environnement (géographique, légal et politique) se distingue de celui des autres langues. Les incidences de l’harmonisation sur l’alphabétisme (la litératie) en général, ainsi que sur les attitudes linguistiques des locuteurs, la littérature et l’enseignement, sont également discutées. La communication médiatisée par les technologies de les technologies de l'information et de la communication: la porte d'accès au domaine de l'éscrit pour les langues africaines? The New Information and Communication Technologies: an open door for written African languages in Senegal? In spite of political declarations in favour of the national languages, French still dominates written communication in Senegal. However, the new information and communication technologies, which are relatively well developed in Senegal, seem to succeed where linguistic policy has failed. Through samples of text messaging (SMS) and chat in Wolof and French amongst students in Dakar, combined with interviews with the informants, I show that written Wolof is gaining ground. Students both with and without university courses in Wolof use it in writing, and even communicate with relatives considered as ‘illiterate’, who are spurred to learn to read and write by the modern media. I thus argue that these new literacy practices may influence positively on the status of African languages in writing. En dépit des déclarations politiques en faveur des langues nationales, le français continue à dominer la communication écrite au Sénégal. Cependant, la Communication Médiatisée par les Technologies de l’information et de la communication (CMT), d’accès relativement facile dans ce pays, semble être en passe de réussir ce que la politique linguistique n’a pas su faire: ouvrir le domaine de l’écrit aux langues africaines. A travers des exemples de manifestation du wolof dans la CMT, collectés auprès des étudiants de Dakar, des SMS, des textes d’un forum de discussion et des méls, je montre que l’usage écrit du wolof s’étend. Des étudiants ayant ou n’ayant pas suivi des cours universitaires de wolof s’en servent, aussi pour communiquer avec des parents considérés comme ‘illettrés’, encouragés par les nouvelles technologies à lire et à écrire. Mon hypothèse est ainsi que ces pratiques peuvent influer de manière positive sur le statut des langues africaines à l’écrit. After Bilingual School. A Study of Code-Switching in Notebooks Written by Two Villagers in Rural Mali In 1979, the first bilingual schools were opened in Mali, introducing one of the national languages, Bambara, in formal schooling, along with the official language French. The literacy practices of young adults who attended one of those schools are studied through ethnographic research, in order to appreciate the results of bilingual schooling in terms of their present practices. Villagers often hold personal notebooks dealing with important events like births and deaths or recording useful information in various fields. These notebooks are usually bilingual, mixing French and Bambara. This chapter discusses different sociological hypotheses in order to account for this form of bilingual literacy. Written code-switching is carried out in different ways in the notebooks studied in this chapter, but French remains the main code and often preserves its higher status. This study of bilingual literacy practices thus provides new insight regarding the outcomes of bilingual schooling. Au Mali, les premières écoles bilingues (franco-bambara) datent de 1979. Une enquête ethnographique menée dans un village qui a accueilli une de ces écoles, auprès de jeunes adultes, permet d’aborder les acquis de cet enseignement bilingue à travers leurs pratiques actuelles. Une pratique récurrente chez ces agriculteurs est la tenue d’un cahier personnel où sont consignés événements marquants et données variées à conserver. Ces cahiers sont souvent bilingues, associant français et bambara. Nous nous proposons de présenter les hypothèses sociologiques qui permettent de rendre compte des différents usages du bilinguisme à l’écrit. Le code-switching à l’écrit s’opère selon des modalités diverses que l’étude de deux cahiers permet de dégager. Le français demeure très présent, préservant souvent son statut privilégié. L’étude des pratiques bilingues de l’écrit jette un éclairage nouveau sur les acquis de l’enseignement bilingue. This chapter explores the pedagogic viability of the traditional oral literature of the Yoruba people of South-western Nigeria. The genres considered include: riddles, tongue twisters, poems and rhymes, songs and games (storytelling is left out here because it is much used and commented upon already). The chapter exposes those aspects that can be used in the classroom as pre-reading activities which will help to develop the attitudes and skills that children need before the formal reading process can begin. Amongst these are: maturity and stability which affect confidence, oral language facility, linguistic awareness, problem solving, critical thinking, observational skills, memory, sensory and motor development, the ability to discriminate both visually and aurally and to coordinate hands and eyes. Besides, oral literature conveys knowledge of moral and societal values and is a culture-near way of awakening children’s interest in learning. These aspects constitute effective instruments in the hands of the teacher for imparting knowledge and providing experiences that will make beginning reading meaningful. Vers un programme enrichi d’introduction à la lecture en yorouba Ce chapitre examine les moyens d’utiliser, à des fins pédagogiques, la littérature traditionnelle du peuple yorouba dans le sud-ouest du Nigeria. Les genres pris en considération sont : les énigmes, les expressions très difficiles à prononcer (tongue twisters), les poèmes et comptines, les chansons, et les jeux – les contes étant déjà souvent utilisés et commentés. Le chapitre focalise sur les aspects susceptibles de servir en classe, pour contribuer à développer les attitudes et le savoir-faire nécessaires aux enfants pour commencer la lecture proprement dite. Parmi ces derniers se trouvent : la maturité et la stabilité (qui influent sur la confiance en soi), l’expression orale, la conscience linguistique, la résolution des problèmes, la réflexion critique, la faculté d’observation, la mémoire, le développement sensoriel et cinétique, les aptitudes de distinction visuelle et auditive et la coordination mains–yeux. De plus, la littérature orale véhicule des valeurs morales et sociales et permet d’éveiller l’intérêt des enfants pour l’apprentissage, tout en restant proche de leur culture. Ces aspects constituent des instruments efficaces entre les mains de l’enseignant voulant inculquer des connaissances et proposer des expériences qui peuvent inciter les enfants à commencer à lire et donner à cette activité un sens. What is South African Sign Language? What is the South African Deaf Community? What is South African Sign Language? What is the South African Deaf Community? These two questions may look simple but answering them is quite complicated. It is a well-known fact that across the world, the majority of deaf children have hearing parents who are not likely to know a signed language. These children start acquiring their signed language only when beginning (pre)school. The atypical acquisition process is but one of the factors likely to influence any signed language. Another such factor is the spoken language used by the surrounding hearing community. Both (deaf) education and (spoken) language use are complicated issues in South Africa. It is therefore not hard to understand that determining the nature of South African Sign Language is also far from simple. And because it is the signed language which is the most important defining characteristic of any Deaf community, defining the South African Deaf Community is not simple either. This chapter gives an overview of past positions on both these questions and aims at providing some preliminary answers. Qu’est-ce que la langue des signes sud-africaine (SASL)? Qu’est-ce que la communauté des Sourds sud-africains? Les réponses à ces questions ne sont pas évidentes. On sait qu’à travers le monde, la majorité des enfants sourds naissent de parents entendants dont la maîtrise d’une langue des signes est peu probable. Ces enfants ne commencent à acquérir leur langue des signes que lors de la (pré)scolarité. Ce mode d’apprentissage atypique n’est qu’un des facteurs qui peuvent influencer la langue des signes. Le langage oral utilisé par la communauté entendante englobante en constitue un autre. L’enseignement (des sourds) et la pratique langagière (orale) sont des sujets complexes en Afrique du Sud. On comprend par conséquent que déterminer la nature du SASL est tout sauf simple. Et comme la langue des signes constitue la caractéristique définitoire la plus importante de toute communauté de Sourds, il n’est pas non plus facile, en Afrique du Sud, de définir cette communauté. Ce chapitre résume les positions prises par le passé face à ces questions et vise également à fournir quelques réponses préliminaires. Philemon Akach is a Senior lecturer in the Department of Afroasiatic Studies, Sign Language and Language Practice at the University of the Free State, South Africa. He is in charge of the teaching of SASL (South African Sign Language) and interpreters’ training. He has been interpreting nationally, regionally, continentally and internationally. He has also been involved in interpreters’ training in other African countries. His current research interest besides bilingualism in Deaf education, include dialect and foreign signed languages’ influences on the SASL interpreters. He has published extensively in the teaching of signed language and signed language/spoken language interpreting. He is vice-president of the World Association of Sign Language Interpreters (WASLI). Hassana Alidou is Professor of International Teacher Education, TESOL (Teachers of English to Speakers of Other Languages), and Cross-Cultural Studies at Alliant International University, San Diego Campus, USA. She has written extensively on Gender in International Development, the promotion of African languages in education, particularly in the so-called francophone countries, language planning and policies, multicultural education, teacher training, textbook production and the development of literate environments in multilingual settings. She has edited mother tongue textbooks used in Niger and Burkina Faso and has had consultancies for African Ministries of Education, UNESCO, UNICEF, ADEA (Association of Development of Education in Africa), the African Academy of Languages (ACALAN) and German Development Agencies. Birgit Brock-Utne is Professor of Education and Development at the University of Oslo and Director of the MPhil in Comparative and International Education. Her research interests include education in general as well as higher education in Africa, language in education, and donor influence on education in the developing world. From 1987 until 1992 she was a Professor at the University of Dar es Salaam in Tanzania where she learnt to speak Kiswahili. She is the Norwegian coordinator of the NUFU project LOITASA (Language of Instruction in Tanzania and South Africa) and has co-edited four books from the project (2003, 2004, 2005, 2005 with Zubeida Desai and Martha Qorro). Her publications further include Whose Education for All? The Recolonization of the African Mind (2000, republished by africanabooks.org in 2006) and Language of Instruction for African Emancipation (Ed. 2005, with Rodney Kofi Hopson). Herbert Chimhundu is Professor and Director of the African Languages Research Institute (ALRI) at the University of Zimbabwe. Previously, he was Shona Lecturer in the Department of African Languages and Literature (1981-2000), Chairman of the Department (1989-94), and Dean of the Faculty of Arts (1995-2000). He initiated the NUFU funded African Languages Lexical (ALLEX) Project (1992-2006), which prioritized monolingual lexicography, using ICT methodology to produce dictionaries in Shona and Ndebele while also building electronic language corpora, sound databases and other tools for various research purposes. This work was institutionalized and expanded to cover other local languages in 2000 when the project was transformed to create ALRI. Eline Demey obtained a PhD from Ghent University in Belgium in 2005 with a thesis entitled Fonologie van de Vlaamse Gebarentaal: distinctiviteit en iconiciteit (‘Phonology of Flemish Sign Language: Distinctivity and Iconicity’). She taught Flemish Sign Language grammar for two years at the sign language interpreting training programme in Sint-Amandsberg, Gent. She is a board member of the Flemish Sign Language Centre, a non-profit organisation promoting sign language research and the development of educational sign language materials in Flanders. Samukele Hadebe is a Senior lecturer in the African Languages and Literature Department, University of Zimbabwe. He teaches Ndebele grammar, lexicography and language planning. He was a researcher in the NUFU funded African Languages Lexical (ALLEX) Project and is the chief editor of the first monolingual Ndebele dictionary, Isichazamazwi SesiNdebele (2001). He has written articles on Ndebele literature, music, translation studies and African culture. Kristin Vold Lexander is a PhD Fellow in Linguistics at the Department of Culture Studies and Oriental Languages, University of Oslo. She has studied Wolof at the Institut National des Langues et Civilisations Orientales (INALCO), Paris, Development studies at Oslo University College, and obtained her Master degree within the University of Oslo Studies of Francophone Africa south of the Sahara. Her master dissertation concerned women’s literacy practices in Wolof in rural Senegal and her doctoral thesis concerns literacy practices in NICT (New Information and Communication Technologies) among students in Dakar. Since 1998 she has had several long stays in Senegal. Emily Matabane is an assistant South African Sign Language tutor in the Department of Afroasiatic Studies, Sign Language and Language Practice at the University of the Free State, South Africa. Her duties include teaching SASL (South African Sign Language), training interpreters, training SASL instructors and researching SASL and its use in schools for the Deaf. She is the Chairperson of the Deaf Federation of the Free State, which is a branch of the Deaf Federation of South Africa (DeafSA). Nhira Edgar Mberi is the current Chairman of the Department of African Languages and Literature at the University of Zimbabwe. He teaches Dialectology, Shona Phonology and Language Change. He was a member of the NUFU funded ALLEX (African Languages Lexical) Project, a collaborative, computer-aided, long-term dictionary-making project involving lexicography experts from the University of Zimbabwe, University of Oslo and University of Gothenburg. He was the Deputy Editor of the General Shona monolingual dictionary that was published by the ALLEX Project in 1986. Aïssatou Mbodj-Pouye studied Philosophy and Social sciences at the Ecole Normale Supérieure, Paris, and Bambara at the Institut National des des Langues et Civilisations Orientales (INALCO), also Paris. She completed her PhD in Sociology in March 2007. This work is an ethnographic approach of literacies in the cotton-growing region of Mali. It combines a study of the paths to literacy with a thorough account of literacy practices, through the analysis of multilingual writings. Aïssatou Mbodj-Pouye is currently a research and teaching assistant in the Centre d’Etudes Africaines at the Ecole des Hautes Etudes en Sciences Sociales (EHESS), Paris. Foluso O. Okebukola is a lecturer in the Department of Curriculum Studies of Lagos State University in Nigeria. She is the coordinator of the Diploma in Nursery and Primary Education programme. Her research interests include Early literacy, Curriculum planning and Policy issues. Mekonnen Alemu Gebre Yohannes graduated as a MPhil from the University of Oslo in Comparative and International Education, choosing the specialization area Development and Education. He is now working as a senior lecturer at Mekelle University, Ethiopia. He has also worked as a national consultant for a study on language of instruction in Ethiopia commissioned by the Ministry of Education and UNDP and other donors to education in Africa. Rajend Mesthrie is Professor of Linguistics in the Department of English at the University of Cape Town, South Africa. He is also the current President of the Linguistics Society of Southern Africa. He has published in the fields of Sociolinguistics, with special reference to language contact in South Africa. Amongst his publications are English in Language Shift: the History, Structure and Sociolinguistics of South African Indian English (Cambridge University Press 1992), Language in South Africa (Ed.) (Cambridge University Press 2002), and Introducing Sociolinguistics (Edinburgh University Press 2000). Lazarus Musazitame Miti is a Language Rights Fellow at the Open Society Initiative for Southern Africa (OSISA) in Johannesburg, South Africa. He joined OSISA in 2005 after serving as Associate Professor and Head of Linguistics at the University of Venda, South Africa. He has also taught at the University of Zambia from 1979 to 1990 and at the University of Swaziland from 1990 to 1996. Miti holds a PhD in Linguistics from the University of London and is the author of Comparative Bantu Phonology and Morphology (CASAS 2006), Aspects of CiNsenga Tonology (CASAS 2002) and A Linguistic Analysis of CiNsenga (CASAS 2001). His research interests include phonology and comparative linguistics. Kemmonye Collete Monaka is a Linguistics lecturer in the Department of English at the University of Botswana, where she has been teaching since 1993. She obtained her PhD in Phonetics from the University of London in 2001. She is involved in the development of the indigenous languages of Botswana, particularly that of Shekgalagarhi, a project supported by the Open Society Initiative for Southern Africa (OSISA). She is currently engaged in co-writing a grammar of Shekgalagarhi. Her research interests include phonetics, phonology, historical linguistics of Bantu languages and socio-economic aspects of the Khoesan people of Botswana. Nomalanga Mpofu is a PhD student in a sandwich program based both at the University of Oslo and the University of Zimbabwe. She was also a researcher in the NUFU funded African Languages Lexical (ALLEX) project at the University of Zimbabwe. She is co-editor and co-author of monolingual general purpose and terminological dictionaries in Shona. She has also published articles in refereed journals on aspects of lexis, translation and lexicography. Halima Mohammed Mwinsheikhe is a Senior Curriculum Developer for Biology at the Tanzania Institute of Education (TIE). She holds a BSc (Education) (1977) from the University of Dar es Salaam and a MPhil (2001) and a PhD (2007) in Comparative and International Education from the University of Oslo. Her doctoral research focused on the strategies used by Tanzanian secondary school teachers and students in coping with the English–Kiswahili dilemma during science teaching and learning. The study was part of the NUFU funded Language of Instruction in Tanzania and South Africa (LOITASA) project. Kwesi Kwaa Prah is Professor Emeritus of Sociology at the University of the Western Cape, South Africa. He is currently Director of the Centre for Advanced Studies of African Society (CASAS) based in Cape Town, South Africa. Educated in Ghana, he took university degrees in the Netherlands. He has held research and teaching posts in Sociology and Anthropology in various universities across Africa as well as in Germany, the Netherlands, England and China. Prah has written many books, including: The Bantustan Brain Gain (1989), Capitein: A Critical Study of an 18th Century African (1992), African Languages for the Mass Education of Africans (1995), Beyond the Colour Line (1998) and Mother Tongue for Scientific and Technological Development in Africa (2000). Martha Qorro is a Senior Lecturer in the Department of Foreign Languages and Linguistics at the University of Dar es Salaam, Tanzania, where she has been teaching Communication Skills in English since 1983. She has conducted research in the area of language in education in Tanzania and has co-edited several books. Four of the books were from the NUFU project Language of Instruction in Tanzania and South Africa (LOITASA) with Birgit Brock-Utne and Zubeida Desai (2003, 2004, 2005, 2005). She has also co-authored (with Zaline Roy-Campbell) a book on Language Crisis in Tanzania (1997). Martha Qorro is currently the Associate Dean (Practicum) of the Faculty of Arts and Social Sciences at the University of Dar es Salaam. Irène Rabenoro is a professor at the Department of Anglophone studies, University of Antananarivo, Madagascar. She is currently Ambassador, Permanent Delegate of Madagascar to UNESCO and the Personal Representative of the President of the Republic of Madagascar to Francophony. She is also a member of the Scientific Committee of the Francophone University Agency (AUF) and a full member of the National Academy of Arts, Letters and Science of Madagascar. Her research interests are within sociolinguistics (especially multilingualism and multiculturalism, language policy and planning), English and Malagasy-French-English translation. Silvester Ron Simango holds a PhD in Linguistics from the University of South Carolina and is a Senior Lecturer in the Department of English Language and Linguistics at Rhodes University in South Africa. His research interests primarily lie in theoretical linguistics – with a focus on complex predicates and the interaction between morphology and syntax in Bantu languages. Since 2000 Simango has worked closely with the Centre for Advanced Studies of African Society (CASAS) on the harmonization of Southern African languages and has taken a keen interest in advocating the use of indigenous African languages as media of instruction. Ingse Skattum is Professor of Francophone Culture and responsible for African Studies south of the Sahara at the Faculty of Humanities, University of Oslo. Her research interests include sociolinguistics, stylistics/rhetorics, language in education, orality/literacy, oral literature and African francophone literature. She has lived and worked in the Ivory Coast and Mali, and studied Bambara at the Institut National des Langues et Civilisations Orientales (INALCO),Paris. She was the Norwegian coordinator of the NUFU project Research concerning the integration of national languages into the educational system in Mali (1996-2006). She has published extensively on bilingualism and orality/literacy, including L’école et les langues nationales au Mali (Ed., 2000) and La francophonie – une introduction critique (co-author, 2006). Tal Tamari is a Research Fellow at the Centre National de la Recherche Scientifique (CNRS), France, and a Lecturer at the Free University of Brussels. She has engaged in research on ‘castes’ (endogamous artisan and musician groups), Islam and traditional religions in Mali. Mamadou Lamine Traoré, who held the opening speech at the Languages and Education in Africa (LEA) conference, tragically passed away on 22 July 2007. He was Minister of Education in Mali (June 2002-July 2007) and also Professor of Philosophy at the University of Bamako, researching both Western and African philosophy. He was active in politics, as one of the founders and the first Vice-President of the political party ADEMA-PASJ (Alliance pour la Démocratie au Mali – Parti Africain pour la Solidarité et la Justice) and later as one of the founders of a new political party, MIRIA (Mouvement pour l’Indépendance et l’Intégration Africaine), of which he was the President. Before being Minister of Education, he had also been Minister of Territorial Administration and Security (1992-1993) and Minister of Territorial Administration and Decentralization. He was particularly concerned with the 1994 school reform which is unique in francophone Africa, introducing national languages in primary school along with the official language French. Cécile Van den Avenne studied at the Ecole Normale Supérieure Fontenay Saint Cloud, France and at the University of Sorbonne. She has a Master degree in Classics, an agrégation of grammar (ancient Greek, Latin, French), a first degree in Bambara from the Institut National des Langues et Civilisations Orientales (INALCO), Paris, and a PhD in Sociolinguistics. She is Associate Professor of Linguistics at the Ecole Normale Supérieure, Lyon, France (2001-). Her publications include Changer de vie, changer de langues. Paroles de migrants entre le Mali et Marseille (2004). Mieke Van Herreweghe is Professor in English Language and Linguistics at Ghent University, Belgium. Her more recent research area has encompassed a contrastive analysis of certain aspects of Flemish Sign Language compared to Dutch, sociolinguistic aspects of Flemish Sign Language and sign language interpretation. She has also been involved in a crosslinguistic survey study involving Flemish Sign Language and the Flemish Deaf Community and South African Sign Language and the South African Deaf Community. Furthermore, she is a certified sign language interpreter and one of the founding members of the Flemish Sign Language Centre, a non-profit organisation established in 1997. Myriam Vermeerbergen started research on the grammar of Flemish Sign Language almost 20 years ago. More recently her research has shifted towards the study of the similarities and differences between the grammars of different sign languages and similarities between (aspects of) sign languages and other forms of gestural communication. She is affiliated with the Department of Afroasiatic Studies, Sign Language and Language Practice at the University of the Free State, South Africa. Myriam Vermeerbergen is co-founder and current president of the Flemish Sign Language Centre and a founding member of the Sign Language Linguistics Society.